I really like more earthy looking bouquets- you know, ones that look like you may have been able to pick them out of your garden that morning. 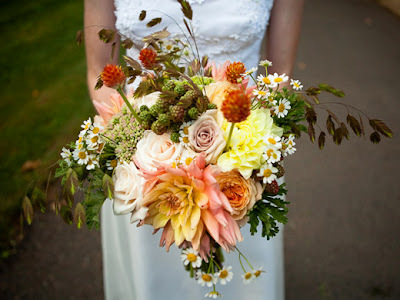 So when I saw this bouquet from Portland based Ink & Peat, I fell hard. I love the soft colors and the whimsical yet hardy feel. It's so nice to see alternatives to the normal all white rose bouquet!